This is a quick writ-up with a more in depth video delving into the configuration of the FLL (frequency locked loop) controller in the MSP430F5637 which applies to the MSP430F5x and 6x families. I'll add a right up this week, but for now all I've got up here is the video. Check back later for more information and leave feedback regarding any comments/questions! The DR1-500-8 data recorder is a high performance data recorder for individuals who require a more powerful tool for their testing/data acquisition environment. This product is currently coming out of development and I'm now working the production platform. Below is a list of stats/features and some discussion explaining the functionality of this device. This is a single sample, discrete, plot of a 1 khz square wave being recorded by all 8 channels running at 50ksps. 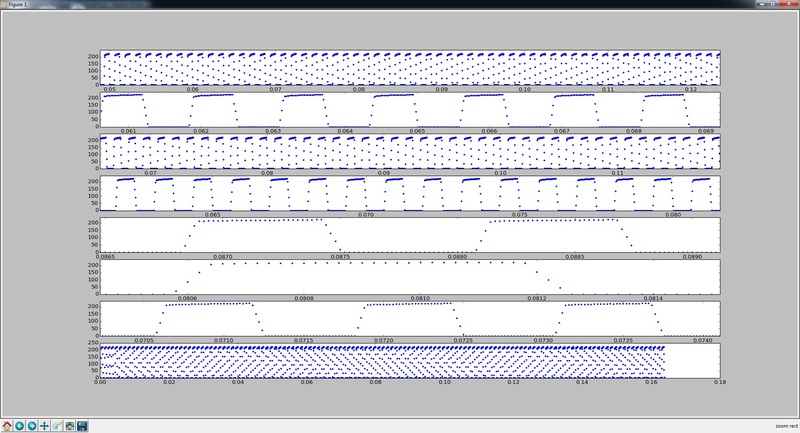 The channels are all tied to the same square wave, but the plots are zoomed to different levels. I've finally got the rev 1. versions of this development board up and running. To get more information on this board, check out the previous few blogs. The first one I put up in support of my kickstarter project describes it's features etc... in more detail. It is going to support the MSP430F5635 MCU because this chip is very robust and great for general embedded development and has the most attractive price point of the 5x family USB MCUs. I'd like to sell these as fully built units supporting USB development. 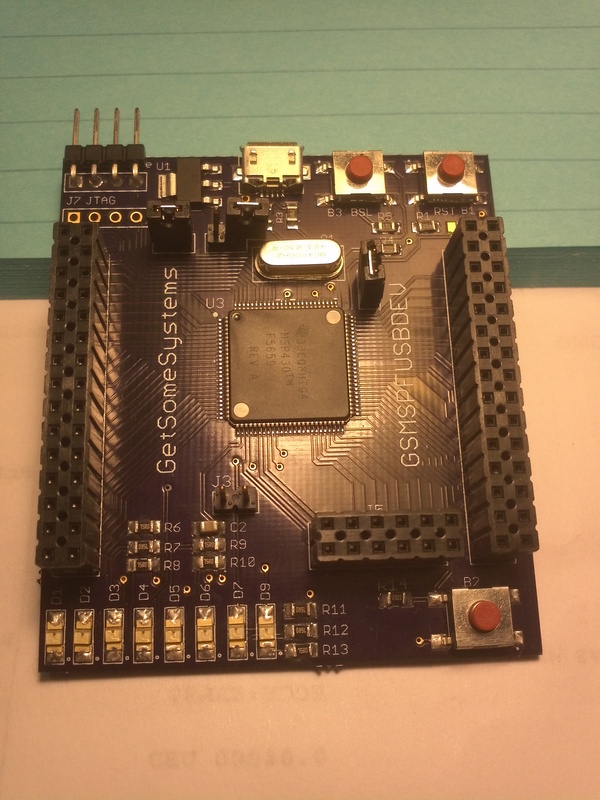 I feel like this board is enticing because it is great for general development using larger, more powerful, MSP430's. 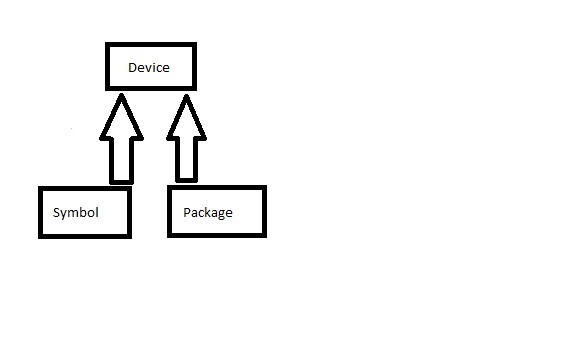 It also supports USB, which was the driver for this design, but it can still be used as a general development platform. The problem with the other boards I found was that they were either USB development boards or general purpose. I didn't see a solution for someone that needed to use both USB, LEDs, buttons, the USCI module, UARTs and the ADC etc... This board allows you access to all of that whether it is on board LEDs/buttons or signals/devices that you can plug into the two 30 pin headers or the 12 pin header. You can also spin a plugin card that can fit right into these expansion headers. Also, almost every pin on this 100pin MCU is broken out to these expansion headers, which allows for great access to all of the peripherals via the MSP430's IO. I also have all of the map-able pins broken out to the expansion headers as well! This is a quick progress blog about the MSP430F dev board which was recently up on Kickstarter. I also give a quick overview of the schematics and layout in the video so you can get an idea of what has gone on thus far and what the design looks like. The boards have been fab'd and are currently being populated by a prototype board/pop house up in Chicago. I'll have a review on those when they get back. I wanted to post up a review of the Kapton stencils I ordered and the company that produced them. Finding a cheap stencil for prototypes was not a trivial matter. I tried the acid etching and didn't have much luck. Finally, I ran across this place that laser cuts Kapton stencils and I was very impressed with their work. I hope this review helps some people out that were in the same boat as me. This was a good low cost stencil solution with great customer support and a great product. I actually only got two Kapton pieces. In the video I said I got four which is incorrect, but what I meant to say is I submitted four designs. One stencil was for the entire PCB and the other stencil contained four additional footprints that I really wanted to get if it didn't cost any more. 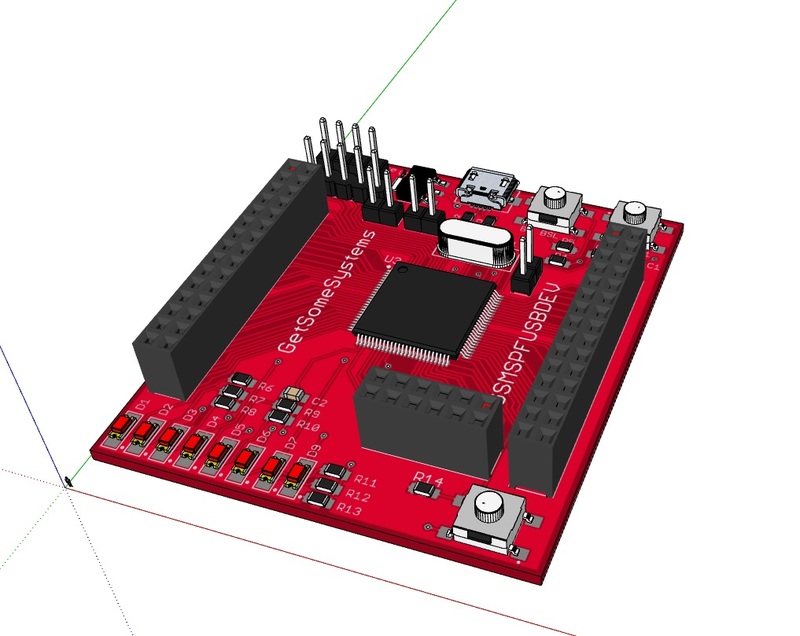 I'm designing a USB capable development board for the MSP430F5xxx and MSP430F6xxx family microcontrollers. This was a kickstarter project as well which didn't get funded, but I'm continuing on and all of the updates and materials of interest will be posted on my website. Below are some 3d models of the board I'm developing. After seeing it, I will explain some of the drivers and where this going as well as why this platform is unique. The chip I'm going to be talking about is the MCP34063. I really like the chip because it is very cheap, which is great for learning because you will most likely burn some up, and it's one of the older regulator IC's out there so there is some information floating around the internet that can help you get started. I went with TI for this because they have great customer support via their forums which is really one of the best resources out there if you are interested in learning some valuable lessons in design etc... The DIP package is also really nice and as you may have found out by looking at higher frequency switching IC's, not everyone produces a DIP package. This is a regulator that boosts an input voltage range of 0.9V to 1.7V up to 3.3V. It's based on the MCP1640 which is a 500kHz switching regulator. This boost module can supply up to 100mA. It is up for sale on the products page and is a great development tool! This is just a quick post going over some basic IO functionality utilizing a booster pack I designed for the launch pad. I am toggling all of the IO pins of interest for my booster pack to make sure this new board I built up works correctly. I decided to post this because it is simple and easy to understand. There is also code for interrupt service routines that may help a few of you out.